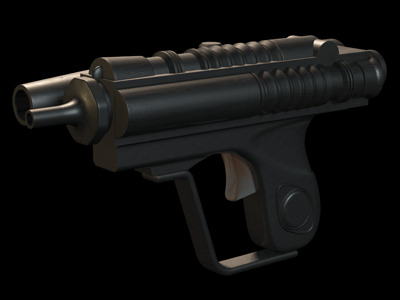 The scout blaster or scout trooper blaster pistol is a standard-issue holdout weapon, traditionally carried by scout troopers in a boot holster. The pistol has an enlarged pressure-sensitive stock rather than a trigger so that a scout trooper is able to easily shoot with gloved fingers. 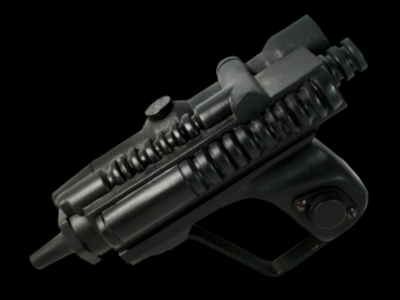 This fast firing weapon weighs only half a kilo and measures 21 centimetres long from tip of the barrel to its end, making the blaster easily concealable in a combat uniform and a common choice among officers. 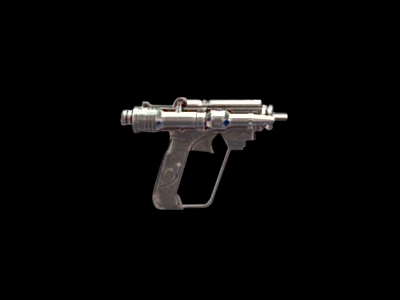 The weapon's compact nature comes at a cost; the blaster's one centimetre short-range barrel is only effective for close-range combat and the relatively small power cell makes for a limited firing capacity. The features of the gun include a side-mounted targeting scope, a phase amplifier and a miniature rear gas cell.